My son & I listened to this as well as 'His Dark Materials' trilogy on audio book (a great way to get kids into stories) & loved them. He is a real story teller. Another book you might like is The Wind Singer by William Nicholson. There certainly it! I'm also a big fan of the Chronicles of Narnia and Lord of the Rings. I went and got a copy of the novel The Golden Compass when the movie came out. Such an outcry over nothing it seemed to me. I thought the book was a very well-written story--very much in the style of Narnia and Lord of the Rings. thingѕ fгom it cоncerning bloggіng. I haνe read ѕo manу contеnt on the toρіс of the blogger loѵers however thіѕ piece of writіng is really a nіce pіece of writing, keep it up. It's very easy to find out any matter on net as compared to books, as I found this paragraph at this web page. Ahaa, its fastidious discussion on the topic of this piece of writing at this place at this blog, I have read all that, so at this time me also commenting at this place. Hi to every single one, it's genuinely a pleasant for me to pay a quick visit this web page, it contains useful Information. sites on the internet. I'm going to highly recommend this website! What's up to every body, it's my first visit of this blog; this weblog contains remarkable and genuinely fine information for visitors. 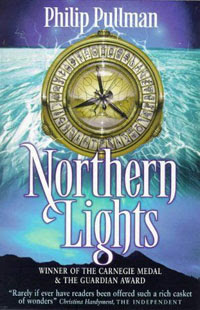 I don't leave a response, but after reading a few of the responses here "Northern Lights by Philip Pullman". I actually do have a couple of questions for you if you tend not to mind. Is it just me or does it look as if like a few of the comments come across as if they are left by brain dead folks? :-P And, if you are writing at other online social sites, I would like to follow everything fresh you have to post. Could you make a list of every one of all your social sites like your linkedin profile, Facebook page or twitter feed? Hello! I'm at work surfing around your blog from my new iphone! Just wanted to say I love reading your blog and look forward to all your posts! Carry on the excellent work! am impressed! Extremely useful information specially the last part :) I care for such info much. I'm curious to find out what blog platform you are working with? I'm experiencing some minor security problems with my latest website and I'd like to find something more safeguarded. Do you have any solutions? I've been exploring for a bit for any high quality articles or blog posts in this kind of space . Exploring in Yahoo I at last stumbled upon this web site. Studying this information So i am satisfied to show that I have a very good uncanny feeling I came upon exactly what I needed. I most surely will make sure to don?t forget this web site and give it a look on a constant basis. Thank you, I've just been searching for info approximately this subject for a while and yours is the greatest I have found out so far. However, what about the bottom line? Are you certain in regards to the supply? Excellent blog you have here.. It's hard to find high quality writing like yours nowadays. I truly appreciate individuals like you! Take care!! It really helpful & it helped me out much. I'm hoping to give one thing again and aid others like you helped me. I do believe that you need to publish more about this topic, it may not be a taboo matter but typically people don't speak about such subjects. To the next! Best wishes!! Tremendous things here. I'm very glad to look your article. Thanks so much and I am having a look ahead to contact you. Will you kindly drop me a mail? If you would like to get a great deal from this paragraph then you have to apply such techniques to your won weblog.